In its recent past Peru has alternated between democracy and military dictatorship. Also, it is deeply divided politically and economically. A small elite of Spanish descent controls most of the wealth and political power, while indigenous Peruvians are largely excluded from both and make up many of the millions who live in poverty. A preoccupation with political power struggles has meant that the economy and infrastructure have been neglected, a factor which fueled Peru's guerrilla insurgencies. Peru endured a brutal war against Maoist rebels in which up to 69,000 people were killed in the 1980s and 1990's. Violence - in the form of murders and gang warfare - is still a problem and has been linked to the drugs trade. Peru is one of South America's biggest producers of coca - the raw material for cocaine. The UN children's fund, Unicef, has found that most of the pickers in the coca-growing areas in the north-east and south-east are children. 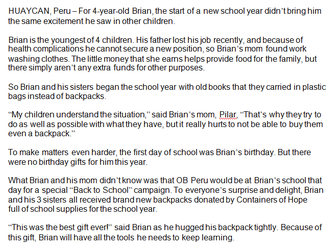 Read an account of a 4-year-old boy, Brian, from Peru who recieved a backpack from Containers of Hope. Click to go to the website. 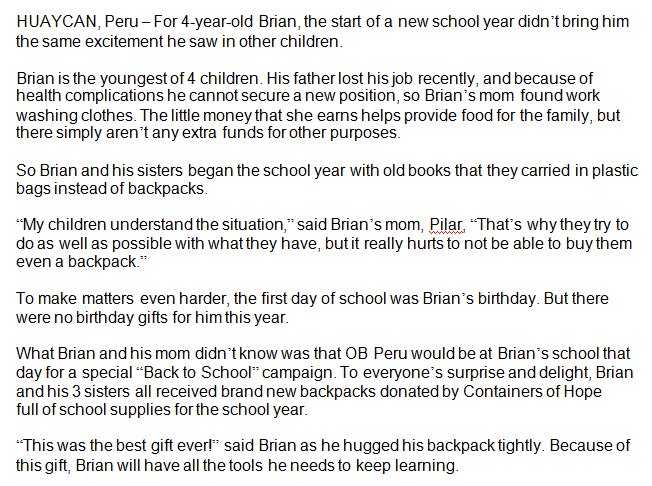 Containers of Hope has partnered with Operation Blessing to reach the children of Peru with backpacks filled with school supplies giving them a chance for the education that will see them out of the poverty in which they were born. ©2018, Containers of Hope, all rights reserved.